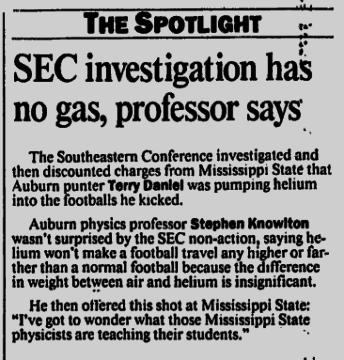 Terry Daniel and Jackie Sherrill star in the screwball comedy “The Helium-Footed Punter” (1993). Attention Professor Brainard: Jackie Sherrill says cut the crap. 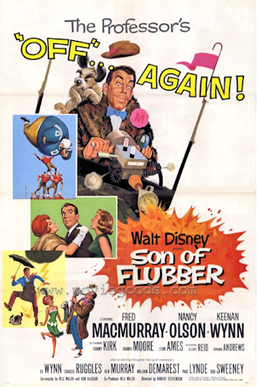 And if he thinks you’re Flubber’ing up the pigskin, even if it’s to preserve a Cinderella season for Medfield, he’s going to call you on it and demand the football be sent to SEC laboratories, which — as if the unheralded, unrewarded, untelevised, undefeated 1993 season of Auburn football wasn’t cinematic enough — is exactly (supposedly) what he did after his Mississippi State Bulldogs fell 31-17 to Terry Bowden’s first group of Auburn Tigers, a team that included a punter named Terry Daniel whose leg strength was envied by Flubber and other lighter than air gases. 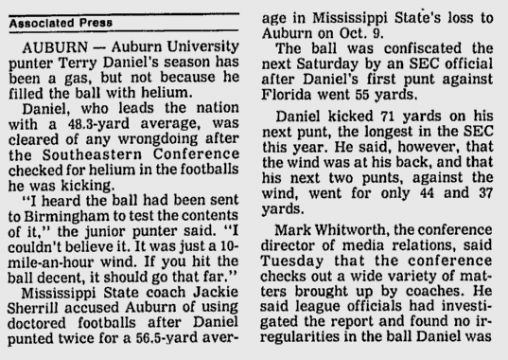 Daniel was the nation’s leading punter, he was a star — when I ran into him 10 years later I could barely bring myself to say “War Eagle.” He punted twice against MSU for a 56.5 yard average. 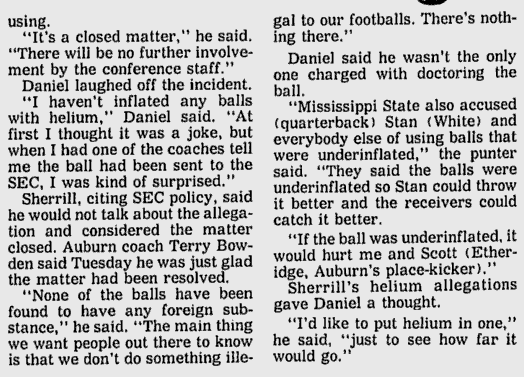 Sherrill thought something was up, as it were — specifically, that Auburn was spiking the football ball with helium. And he complained about it. I’d forgotten all about it. Van reminded me. The Helium vs. Air debate — and it’s really not much of one — was actually the subject of a 2006 episode of Mythbusters that proved that a football filled with helium was actually at a slight, counterintutive disadvantage to one filled with regular old air in terms of distance covered when thrown or punted. 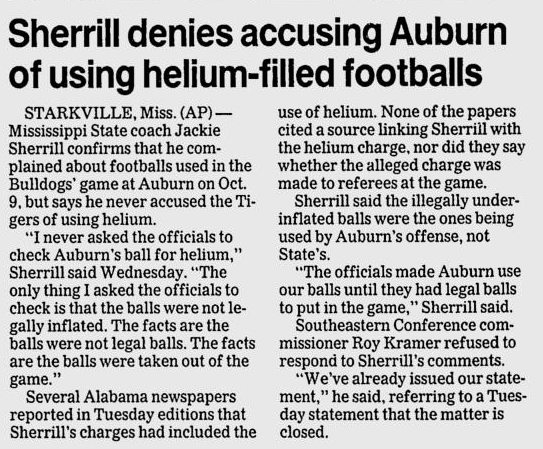 Sherrill’s claim regarding Auburn’s use of underinflated footballs seems a bit underinflated itself, for two reasons: 1) the conference found “no irregularities” in the footballs, and 2) using underinflated footballs would (at least according to the infallible Answers.com) seem to hurt, rather than help, a team. Also, it seems odd that the SEC’s investigation would include a test for foreign substances i.e. (per The New York Times) helium, had no charges along those lines been made. But whatever. 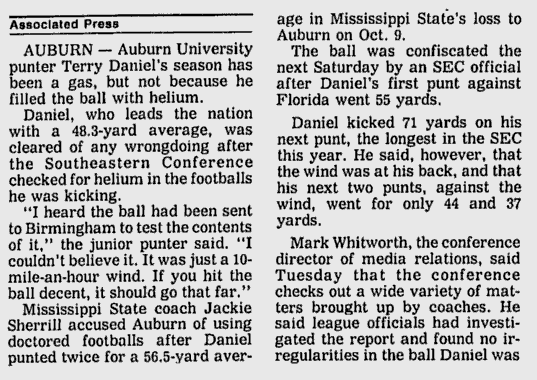 Daniel kicked a 71-yarder against Florida with a ball filled with “honest-to-goodness air.” The SEC closed the case. Auburn went undefeated. The sports sections moved on. 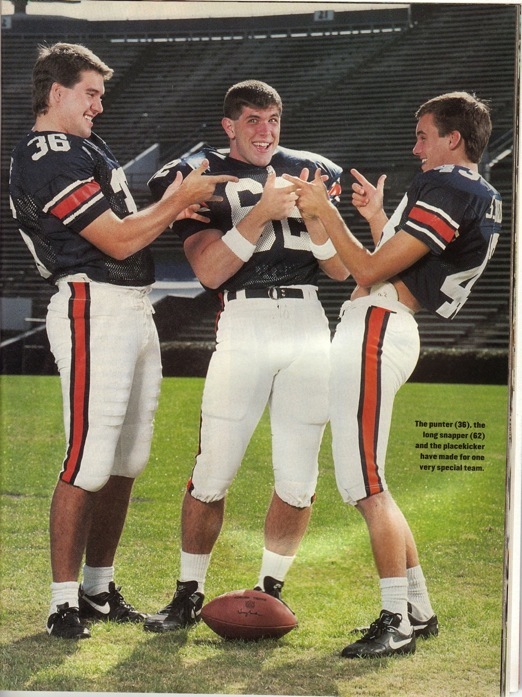 The last, searchable word on the matter seems to have been had by Auburn’s then placekicker Scott Etheridge, quoted in Sports Illustrated’s commemorative “That Perfect Season” issue published that December. You can watch Terry Bowden keep a straight face responding to the helium allegations here. First published Sept. 6, 2011. Related: Mississippi State fan sues Auburn over confiscated cowbell. I’m really glad they can’t wear those cut-off jerseys anymore. I always thought that looked ridiculous. 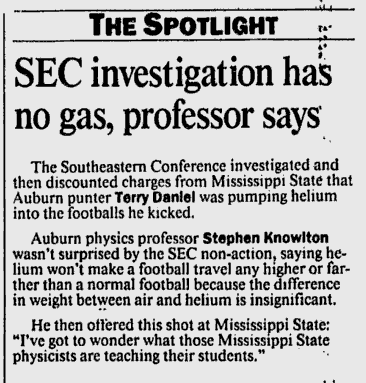 One of my old teachers asked me to judge a junior-high science fair back in Enterprise circa 1994… one of the projects was a study of whether air or helium-filled footballs would go farther (aka “The Sherrill Theorum”). The experiments indicated air-filled balls actually traveled farther using the same “kicker” (a mechanical foot on a pivot, powered by gravity). The Mythbuster guys also tested helium footballs a few years back. They “busted” the theory. 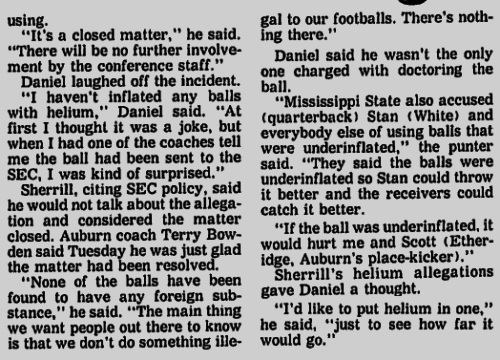 Sherrill shouldv’e stuck an inflation needle in the ball, sucked on it, then said something in a high voice. This incident was laughable. Jackie Sherrill is the LAST coach who needs to accuse any program of wrong doing or cheating! As I recall, after he left MSU they were left in a world of trouble for Sly Croome to straighten out! I own the balloon and gift shop Check-It-Out and yes when this story came out we had a lot of people who called asking if this would work. We would just giggle and say of course not explaining the weight of the pigskin could not be “levitated” by helium or any other lighter than air product. 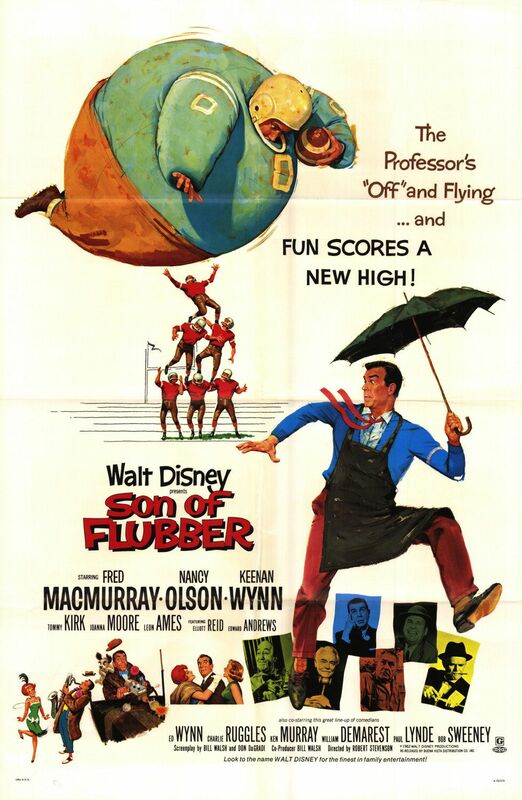 We would explain we inflate balloon footballs with helium but it’s a balloon not a real football. Thanks for the memories on this story. Wasn’t Sherrill caught trying to use bull testicles in the Gatorade illegally in a game against Tejas? So Moo State has been trying to get us in trouble for a while now. and I thought Bama was the only team looking for excuses…I do remember this but never realized they were actually tested.